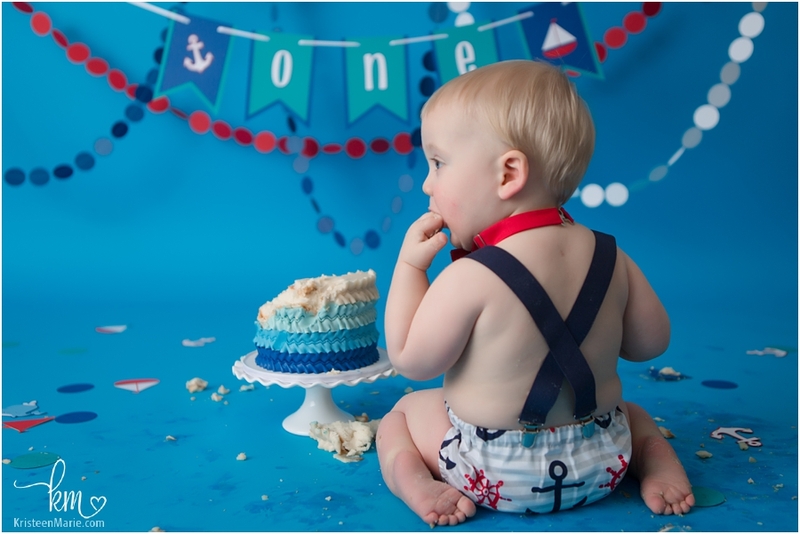 Ahoy there – Cooper is One! This little man sailed in a little over a year ago and it has been so wonderful to watch him grow throughout the last year. Little Cooper is one of the best dressed little men that I know- don’t the coordinated outfits just look awesome! (His momma is quite the planner!!) 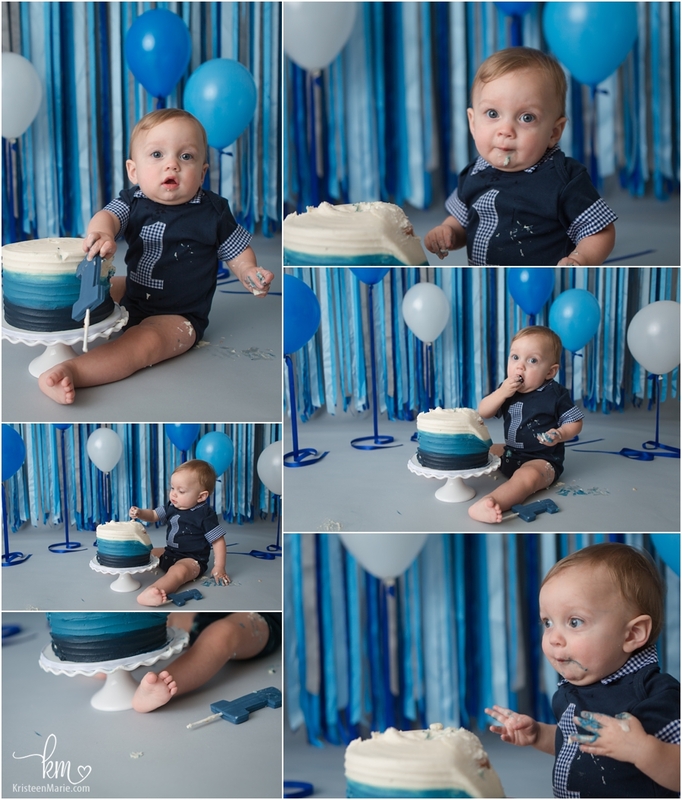 We had a whale of a good time at Cooper’s cake smash and thoroughly enjoyed his cake and he made the cutest faces. He was a great sport for the entire session and I am so glad that he came to visit me in the studio for this very important date! Happy First Birthday, Cooper! 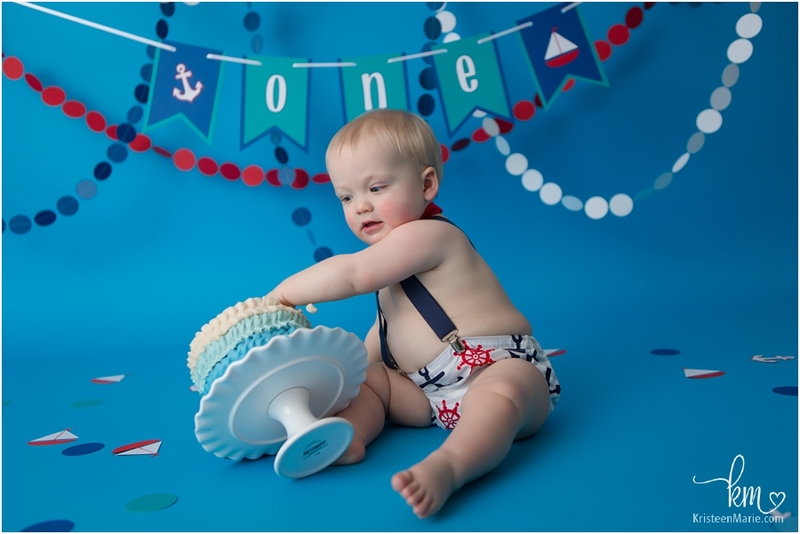 If your little one is getting ready to celebrate their first birthday, I would love to help you celebrate by having their cake smash session in my studio. Be sure to reach out to get a date my calendar! 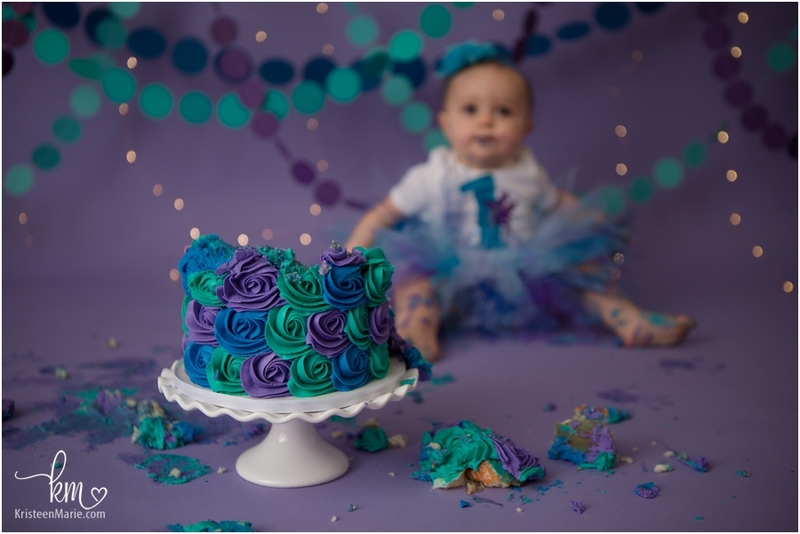 I’m an Indianapolis photographer and I normally book cake smash sessions at least 4 weeks in advance so that we can make all of the plans for the big day! This year was truly a great year both personally and professionally. I feel like I was able to really hit strides with my work/life balance. I made a point to provide top notch service to my clients and to my own family at home. I did this by cutting back on weddings and weekend shooting and working more closely with and providing additional services to the clients that I have. I love and adore every single client and I’m honored that each client choose me to capture this time in their lives. I know you have lots of choices when it comes to photography in Indianapolis. So thank you, thank you, thank you for allowing me to be your Indianapolis photographer!! Here are a 15 highlights from the year. They are in no particular order. I started offering a new styling service. 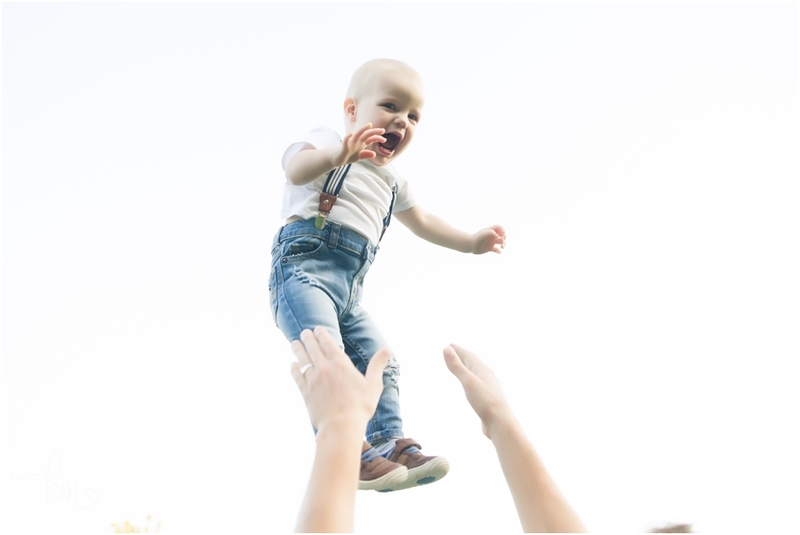 This service can be used for all sessions… everything from in-studio milestone sessions to newborn sessions to maternity sessions. I think the service is most beneficial for family sessions or maternity sessions. This online tool takes the stress out of picking outfits for you and your family!! My clients who have used the service have had nothing but rave reviews about it so far and I’m loving the looks that people are coming up with! You can read more about the service here. 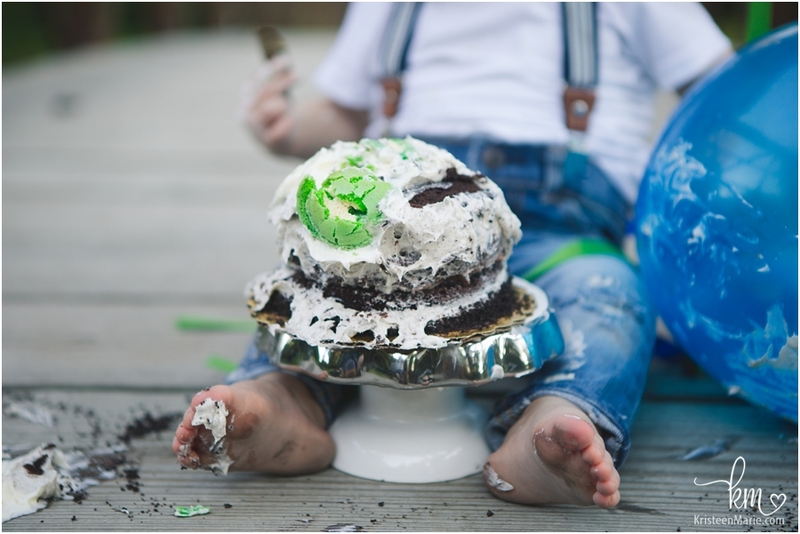 I love a good mess… especially when cake is involved! 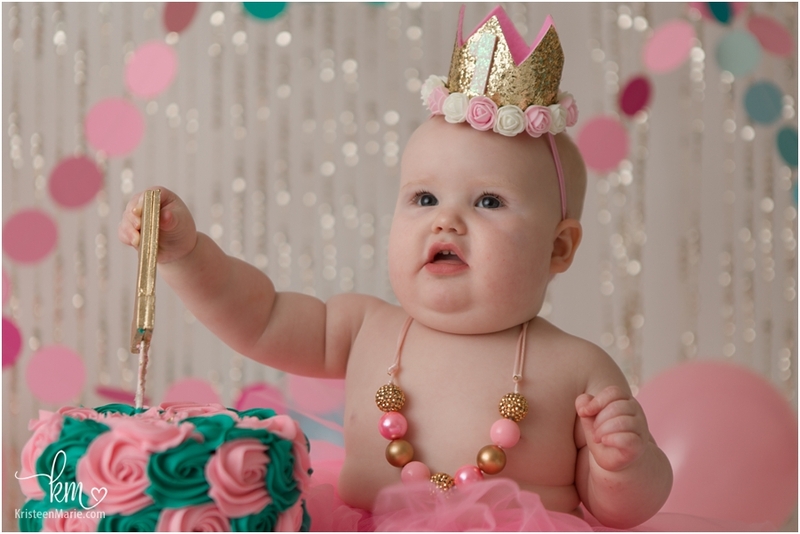 I take great pride in giving each little one that comes into the studio a completely custom cake smash set-up. 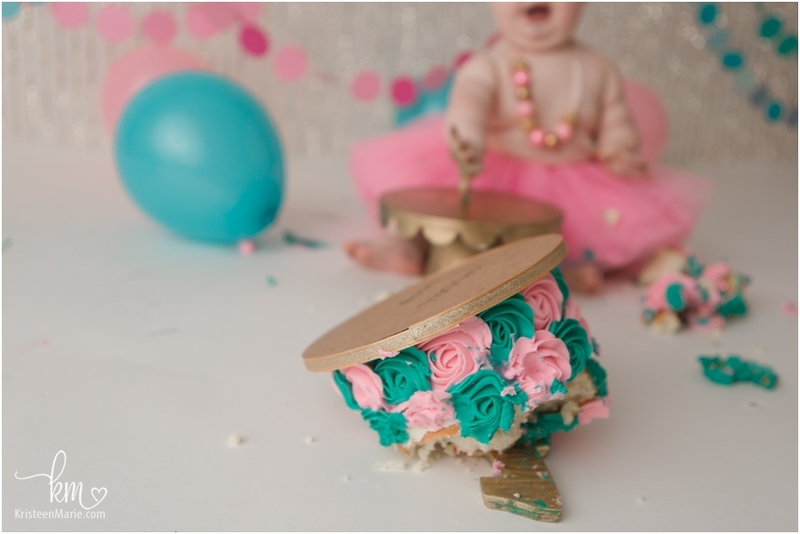 Being an Indianapolis cake smash photographer is a blast. 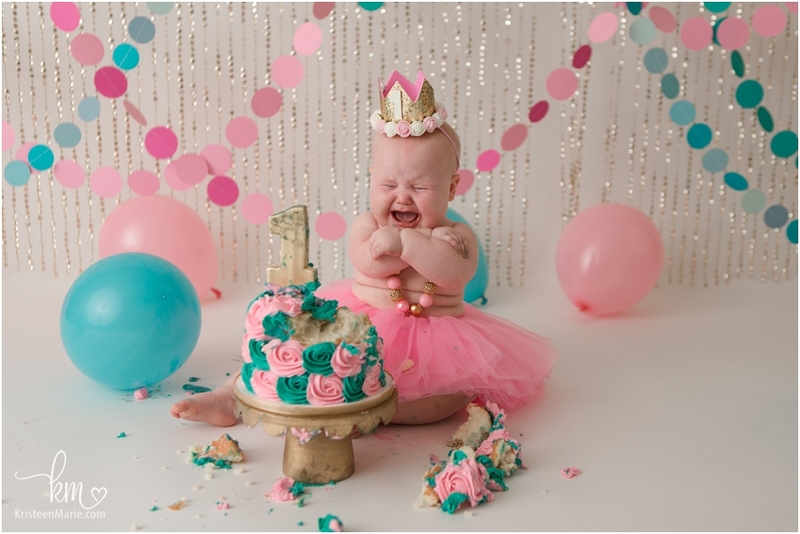 Some kids love cake, some kids love to play with cake, and some just don’t love it. Whatever happens, it’s sure to make some great pictures and memories. 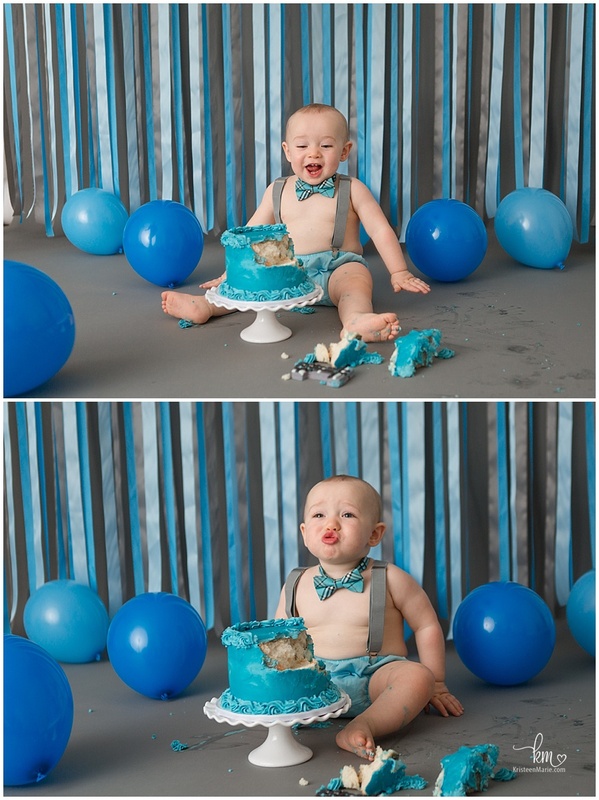 All 36 of these cake smash sessions were so much fun! 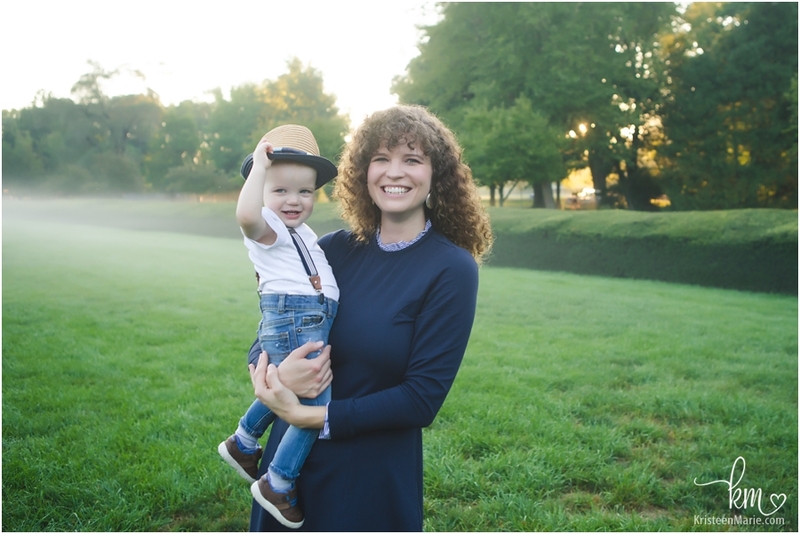 My clients love mini sessions. I offered more variety of mini sessions this year and they all filled up pretty quickly – which I see as a sign of success! This year the mini sessions included Spring Minis, Summer Creek Side Minis, Urban Minis, Fall Minis, Christmas Tree Farm Minis, In-Home Holiday Minis and In-Studio New Year Mini Sessions. Just looking at that list is a little overwhelming! I also always offer the weekday in-studio mini milestone sessions. 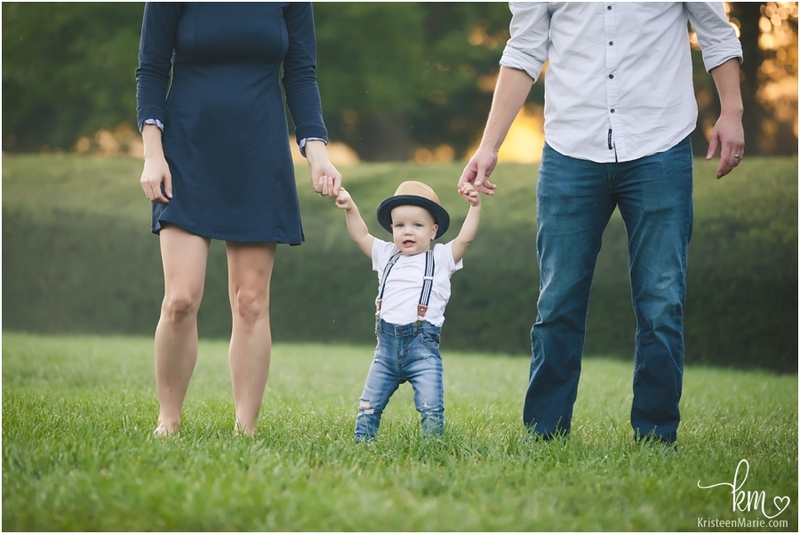 These mini sessions are a great way to update your family pictures without a large investment. 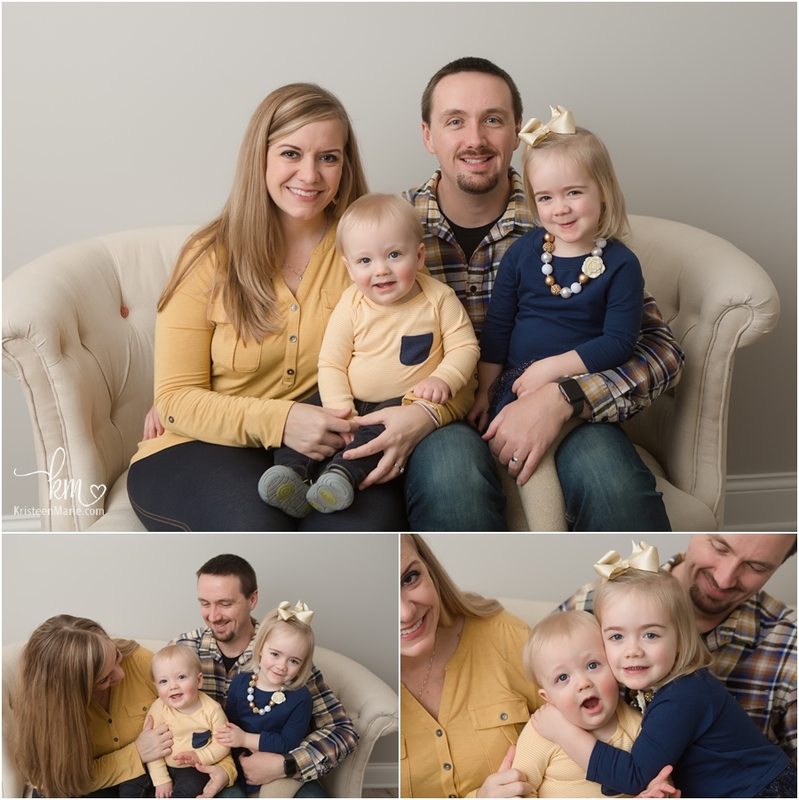 Many families chose to do multiple mini sessions so they could capture their families a few times in one year. I do plan to offer more minis sessions in 2019. Be sure to subscribe to my email list to be the first to hear about these. Also, you will see the dates and times update here if they have already been announced via my email list. This feature was a big surprise to me! It wasn’t something I applied for or anything. But what a fun and amazing surprise and honor!! 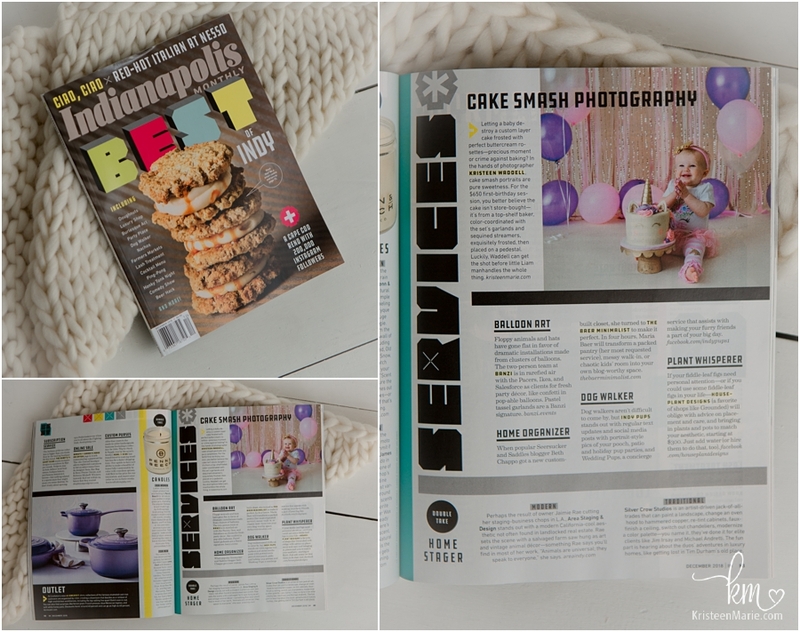 Indianapolis Monthly Magazine featured KristeenMarie Photography as the best Cake Smash Photographer in Indianapolis! There was a half page spread on my services and they featured a lovely image I took. So fun!! 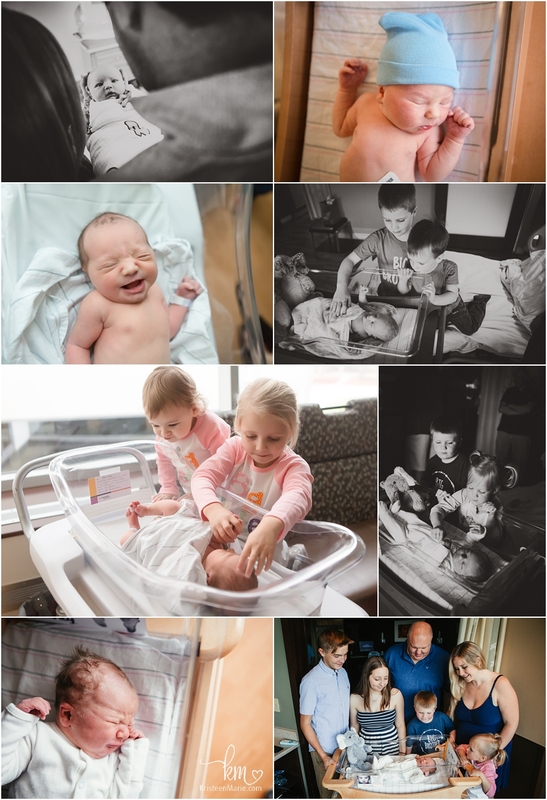 Being an Indianapolis birth photographer is one of the biggest joys of the job. Shooting births is one of my favorite things!! 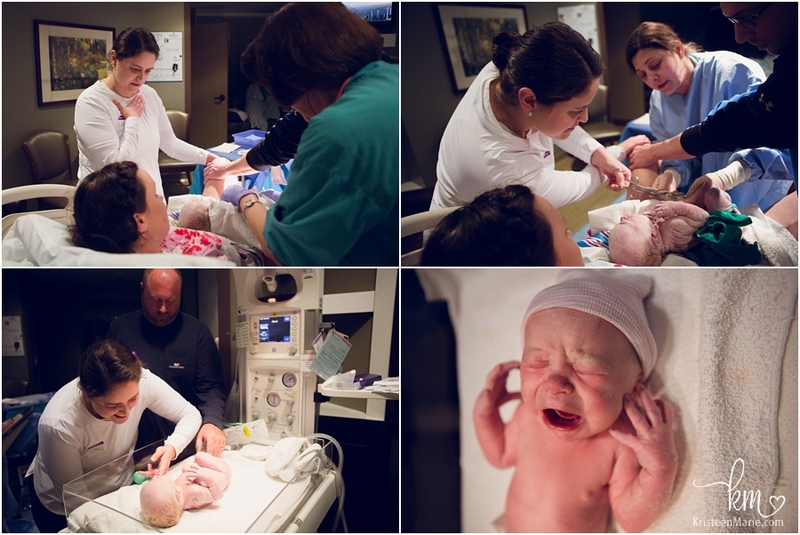 I shot a number of births this year, but by far my favorite birth was the surrogate birth that I photographed. This was something new to me and it was so cool to witness! Thank you to all my clients who allowed me into their personal birth space to allow me to capture this very intimate time in their lives. I will forever be honored to have been able to capture the birth of your children. Not every guy hires a professional photographer when he proposes, but if you really want to knock your proposal out of the park then you hire one! While I only did two Indianapolis proposal photography sessions this year they were both killer proposals!! Take note guys, these two knew that they were doing!! We switched our CRM from ShootQ to Dubsado. This tool is what we use to collect payments and have clients sign contracts. Dubsado is much more user friendly then ShootQ and if you noticed a change I hope you love it as much as we do!! We also switched our client gallery hosting. We switched from Smugmug to Cloudspot. The new galleries are SO much nicer then the old ones and easier to use too. I hope you love these too!! Some of these families have been with me for YEARS. One of my favorite things about my job is being able to watch kids/families grow over the years and building relationships with my clients. It means the world to me to be able to capture these families year after year! 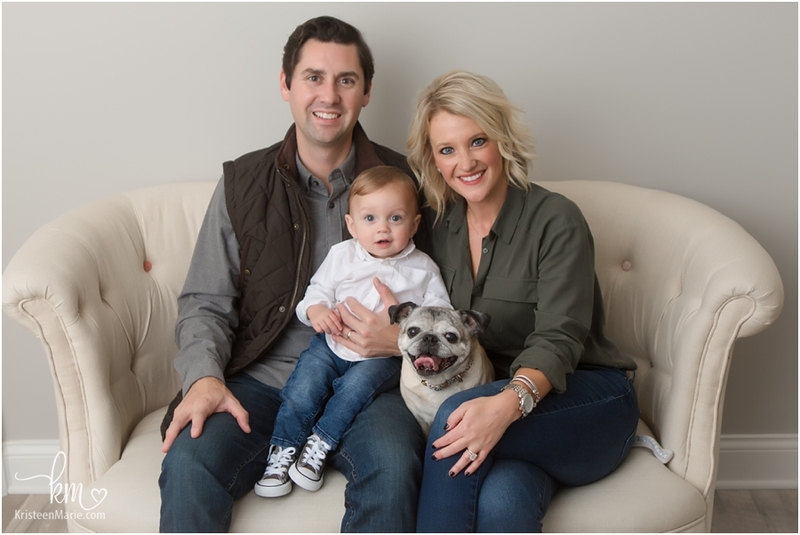 I’m excited to start getting my 2019 calendar filled for family sessions. 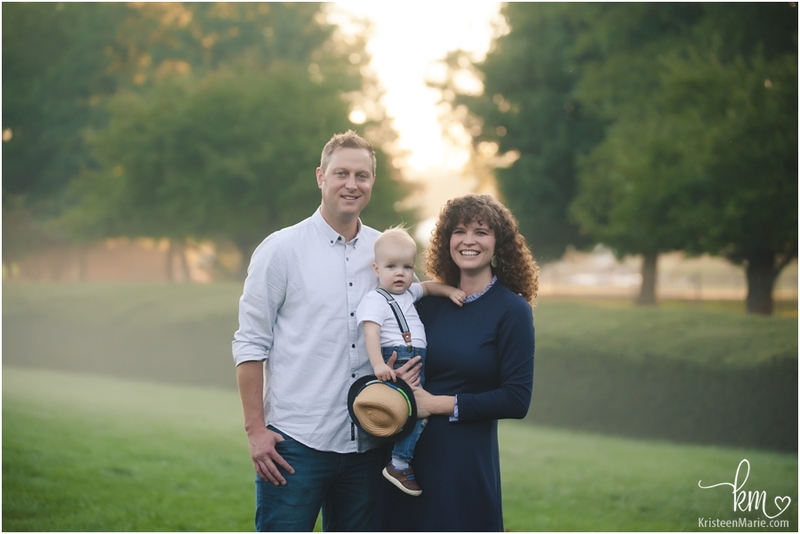 If you are looking for an Indianapolis family photographer this year. please let me know so we can get something on the books! Even though I’ve been in business for over 10 years now there is always still more to learn! This year I attended the Reset photography conference. I had the awesome opportunity to watch some pretty amazing photographers work including Sarah-Beth Photography, Twig + Olive Photography, The Herrintons, and Spanki Mill. You can read more about my takeaways from this photography conference here. Is there anything better then a fresh new baby?! I think not! I’m actually kind of surprised I didn’t do more of these because I ADORE Fresh 48 sessions. If you are even considering doing a Indianapolis Fresh 48 photography session in 2019 let me know! 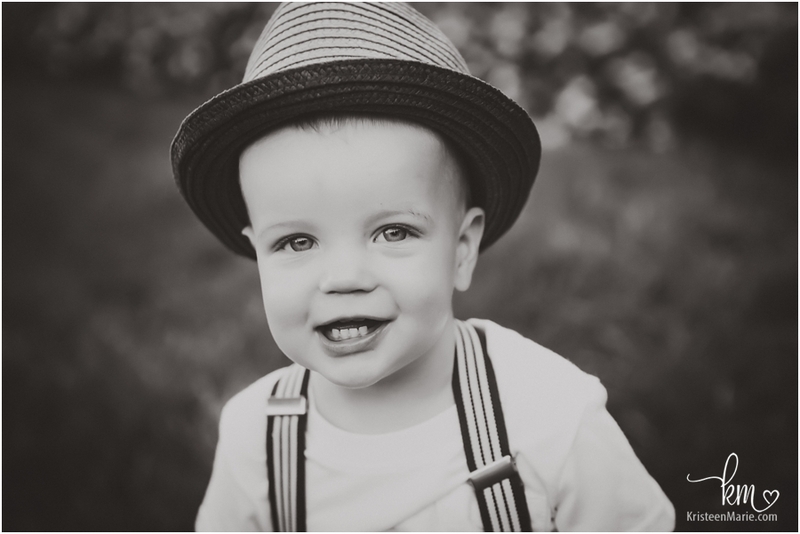 I would love to capture your little one in those early hours of his or her life! Seriously, contact me if you are even considering this. I want to see all of those brand new baby toes. Look at all those beautiful baby bumps!! All those glowing mamas and mamas-to-be were just stunning. I can’t wait to do more Indianapolis maternity photography in 2019! Wow – that’s a big number! That’s an average of one per week throughout the year. 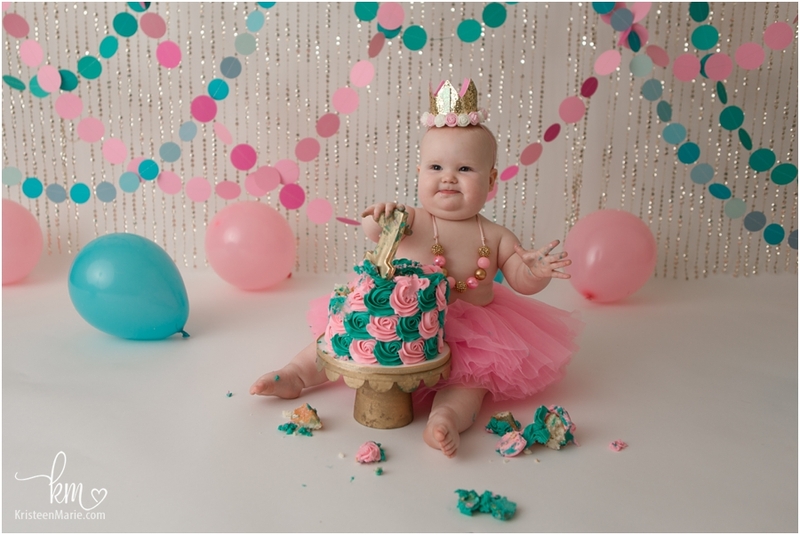 Most of these milestone clients were first newborn clients in the studio. And we all know that I adore watching my clients grow so that makes my heart so happy!! Yes – I still shoot weddings. No – I don’t shoot a lot of them. I used to shoot 30+ weddings a year. However, I’m not at a point in my life where I can sustain that. Plus, it’s not where my heart is. I love shooting weddings but more then 5 in a year, and I don’t love it anymore. I give everything I’ve got to my wedding clients and I hope that they see that on the day of their wedding and in the final photo product. Next year I expect to shoot about 5 weddings too. 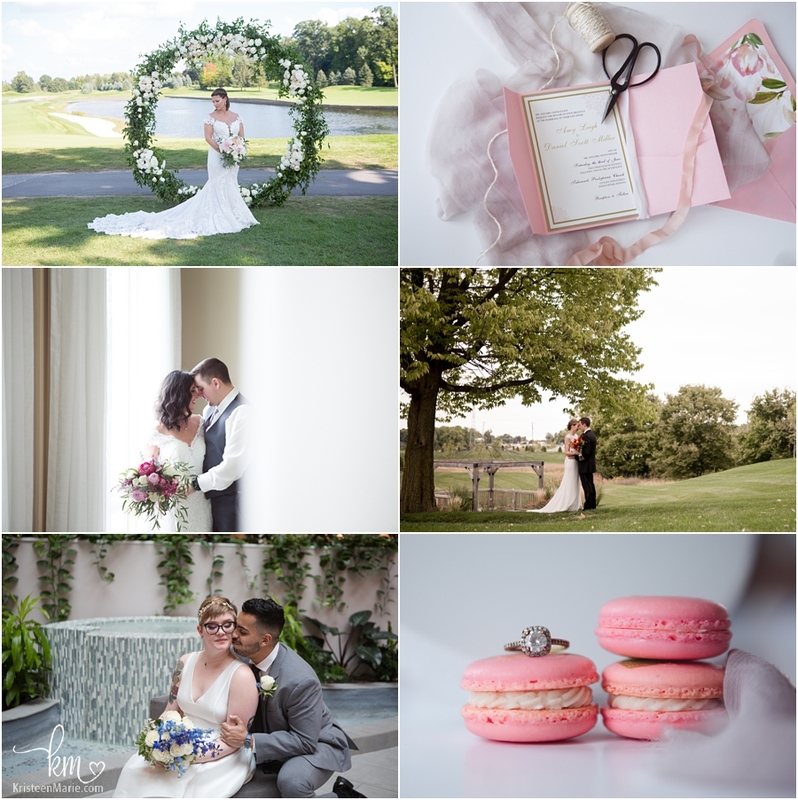 If you are looking for an Indianapolis wedding photographer feel free to reach out! Let’s see if I’m a perfect match for your big day. If I had to pick only one thing to photograph for the rest of my life it would hands down be newborns. Good news is I don’t have to pick just one thing. But it’s no surprise that I did more newborn sessions then any other type of session. These are just the Indianapolis newborn photography sessions that were done in the studio too. I also had some in-home lifestyle newborn sessions and some clients added on outdoor newborn sessions to their packages in the summer months. So many beautiful brand new babies and their families. This video was actually shot in 2017 but wasn’t complete until 2018 so I think it still counts! If you haven’t seen it yet you should really check it out below. The video shows me in my element working as an Indianapolis newborn photographer in my studio. The lovely Erin Werner from Little Nuggets Photography produced this awesome video for me and I just love it! I’ve said it before and I’ll say it again. I LOVE my joy. And I love each and every one of my clients. I couldn’t do what I do without the trust that each and everyone of you give to me to capture this special time in the lives of your families. Thank you 100 times over for allowing me to be your Indianapolis photographer!! I hope to see you again in 2019!! 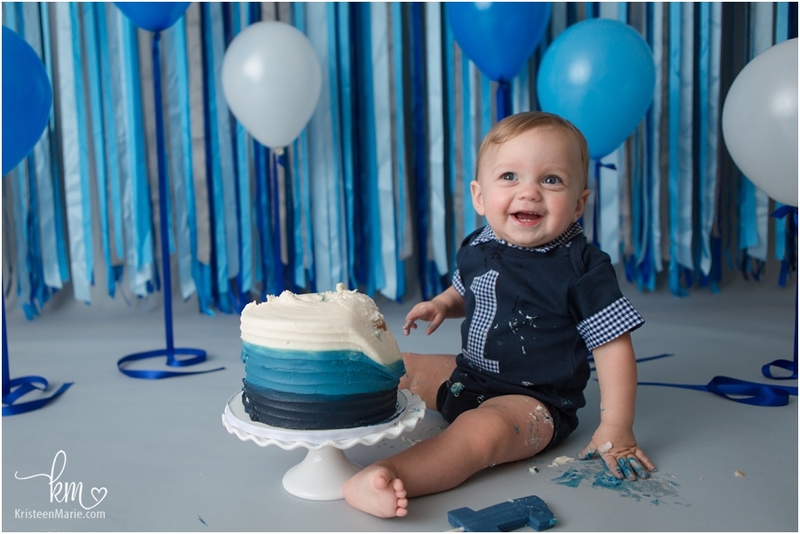 This handsome little fella took a couple minutes to warm up to the cake smashing, but once he figured out it was fun he definitely gave us some great smiles! 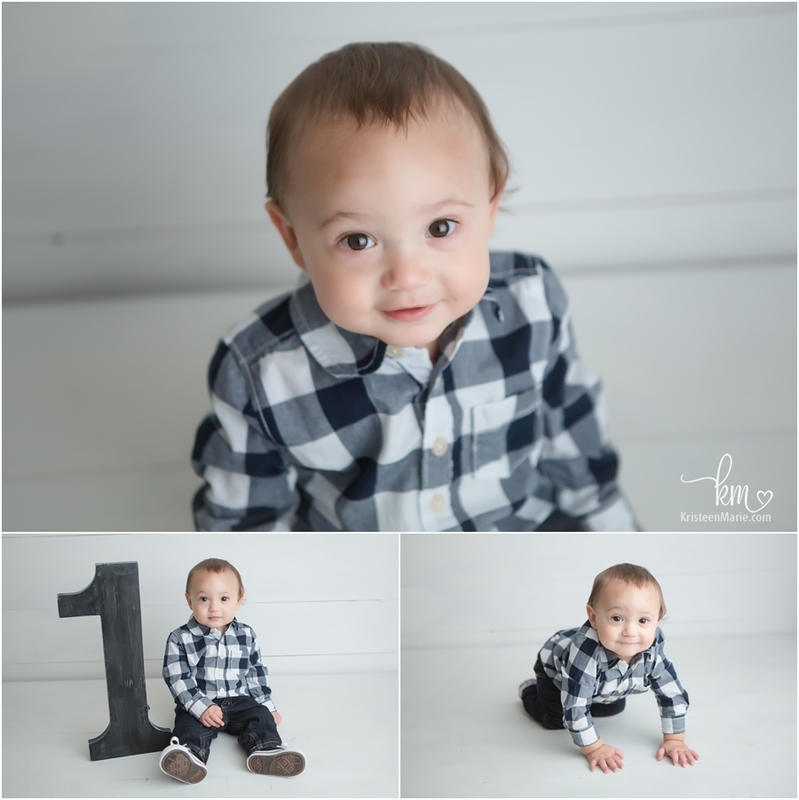 I have been photographing this guy from birth so I know that once he smiles they are camera worthy and oh so adorable! The little outfit in the first few pictures is a family heirloom. 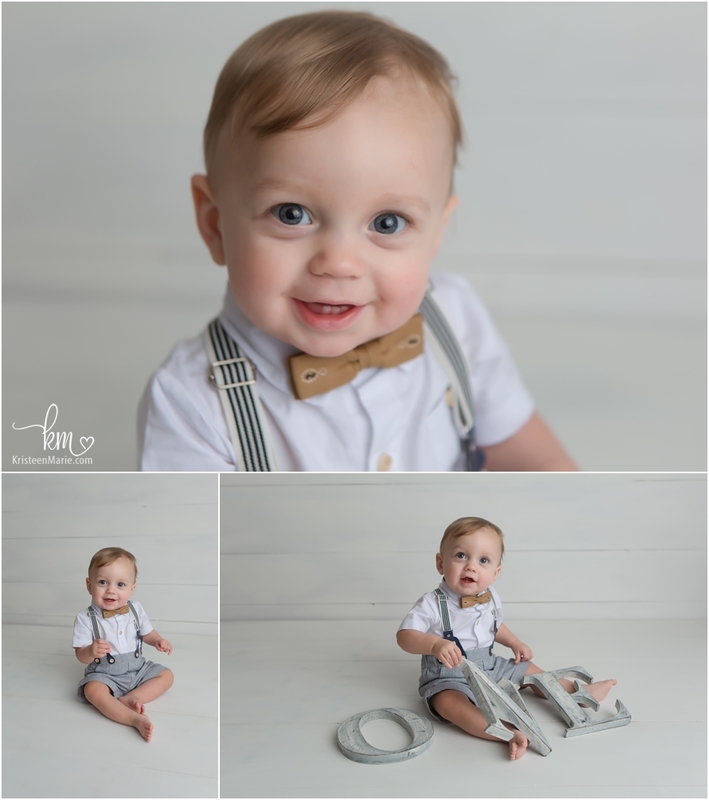 How cute is that little old fashioned bow tie!? Happy 1st birthday, little man! I hope to see you again soon! 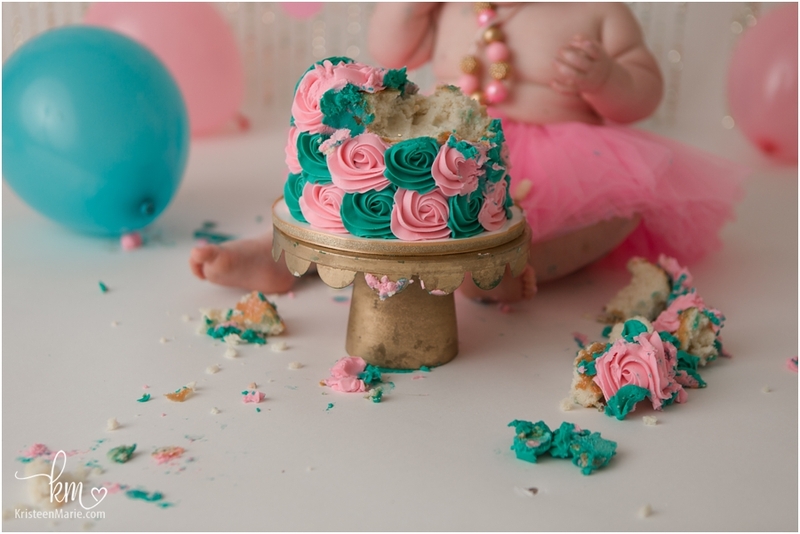 Want to have some cake smash photos of your little one? 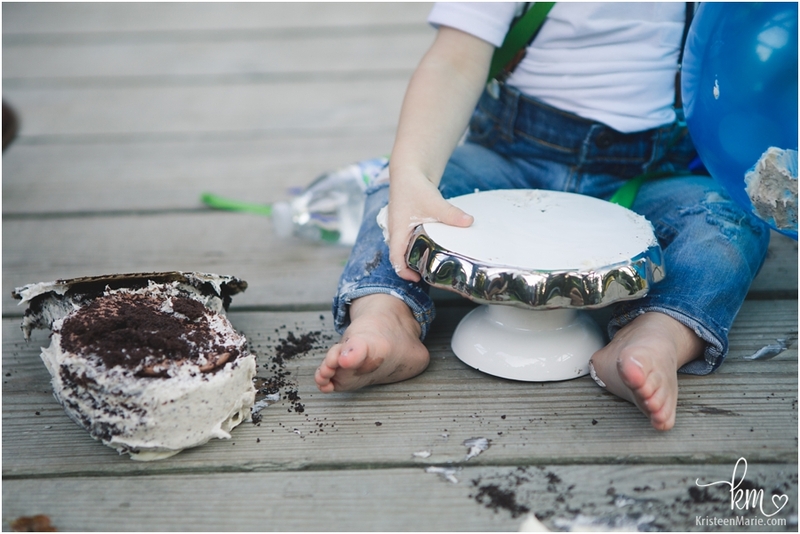 I offer personalized cake smash sessions to fit your theme! I would love to hear what you have in store. I have had joy in watching both of these adorable kiddos grow up since their births. I just absolutely love the rolls on both of these beautiful babies! Sweet little Violet was very happy with the balloons and really loved the cake as well. Aren’t these two smiles just the cutest you have every seen? She was definitely upset when it was all over. Be sure to check out all the adorable images below! Let me know if you are looking for an Indianapolis Photography Studio. 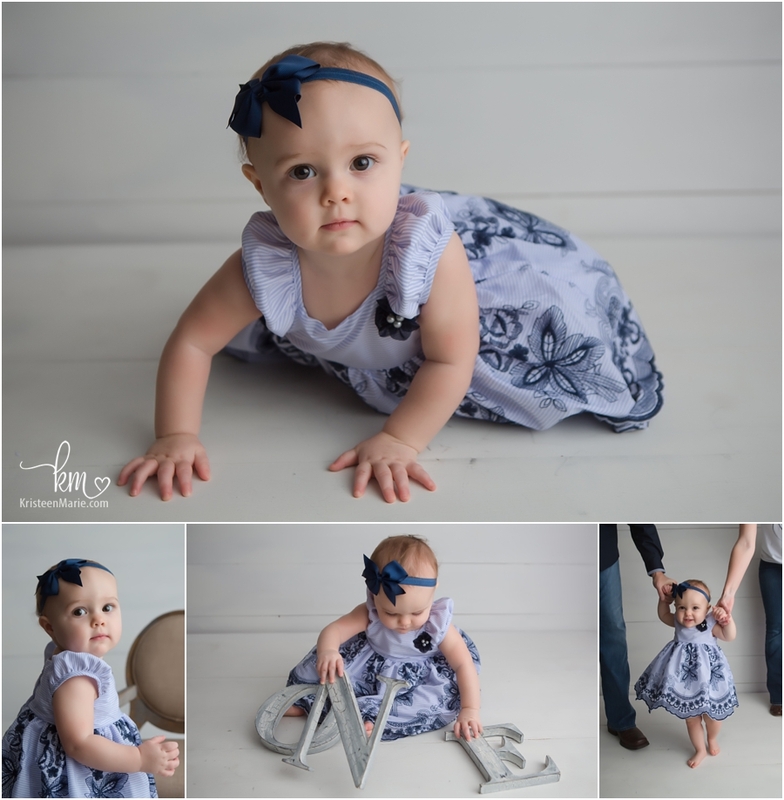 I would love to have your little one(s) in the studio for their next milestone. I offer Indianapolis newborn photography, milestone sessions for all ages, and Indianapolis family photography. 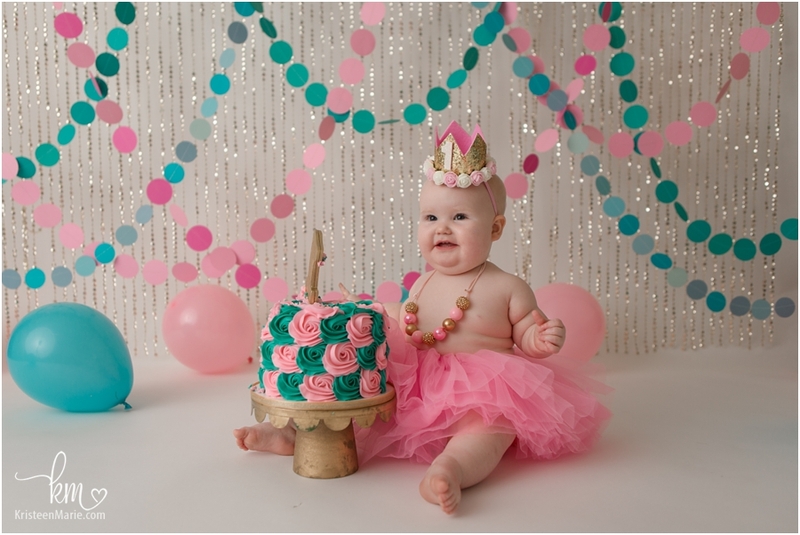 I have been photographing this little lady since birth and we even got to celebrate her first birthday together! 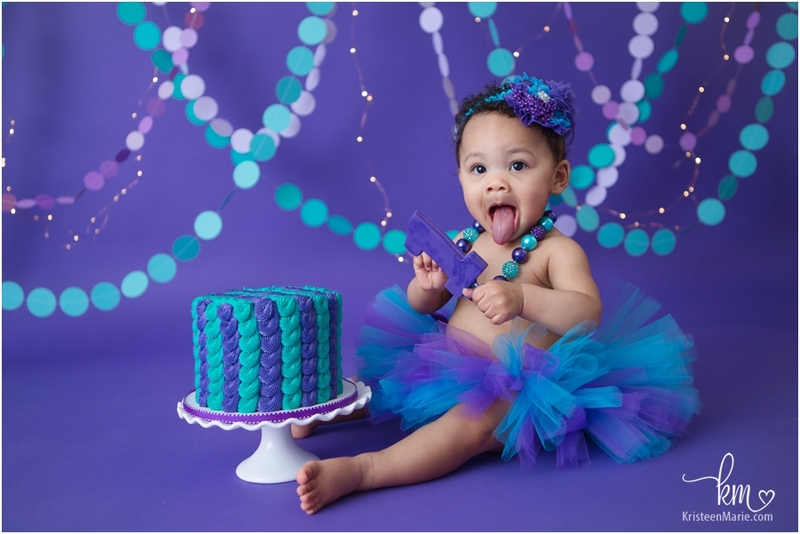 The theme was purple and teal fairy princess. I love the sparkle from the lights, and I think little Miss did as well. 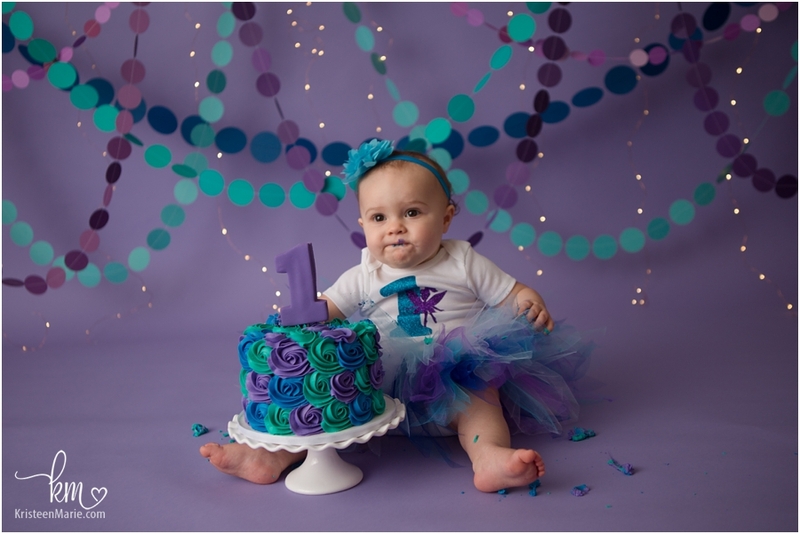 Maybe not as much as she loved the cake, but it’s her first birthday so she gets to have her cake and eat it too! 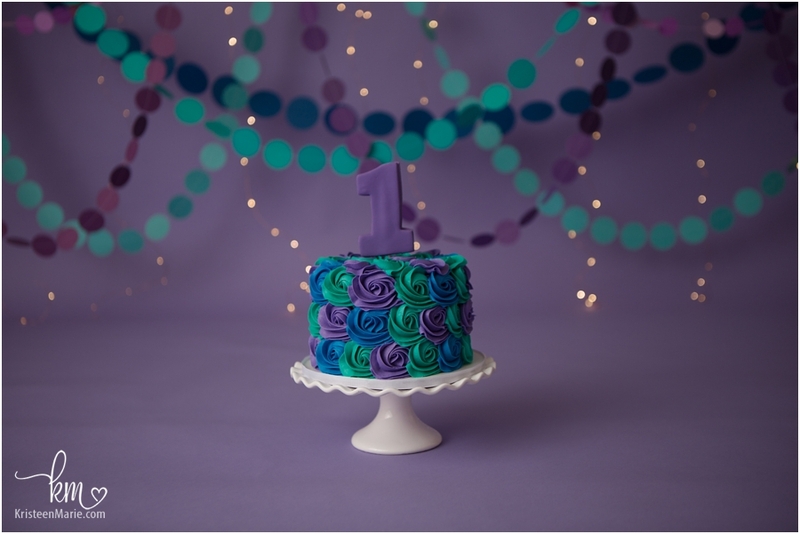 I also love the way that her cake turned out- I love the colors and the vibrancy of the “1”! Be sure to check out the adorable little stars on the tush of her onesie – so precious! I’d say this was a perfect Spark-tacular day! 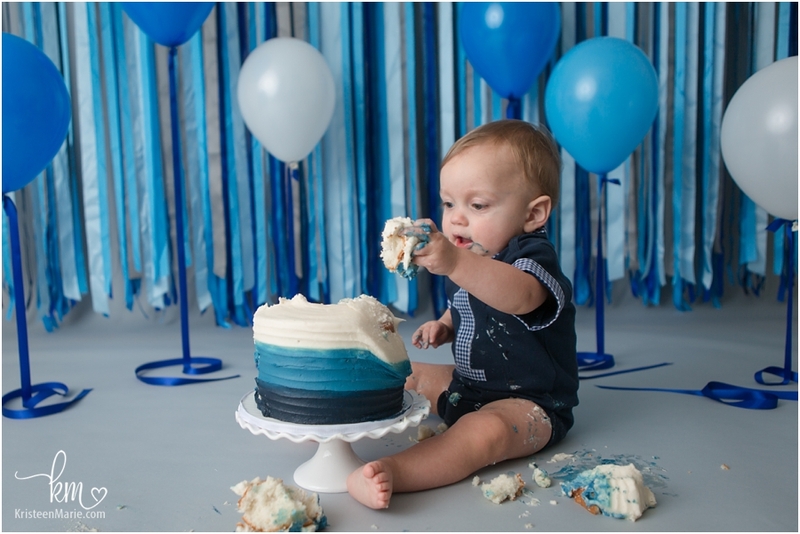 Let’s bring your soon to be one year old into the studio for a personalized Cake Smash session! 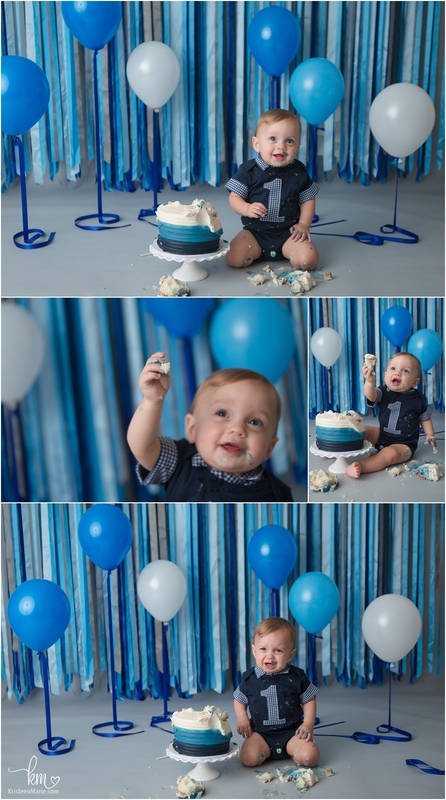 Have the photos taken and the cake to celebrate and then you will have some adorable pictures to send out first birthday announcements or thank you cards! Send me a message today if you are looking for an Indianapolis photographer! Has it really been a year since this cutie entered the world? And even before that, I can remember photographing his parents for their maternity session as well. Time sure does fly when you are working with babies and kids all the time! Arlen and his family came to visit me in the studio for his cake smash. While he did not seem too interested in the cake itself, he really love the number one on top of it and was mesmerized by the cake stand! 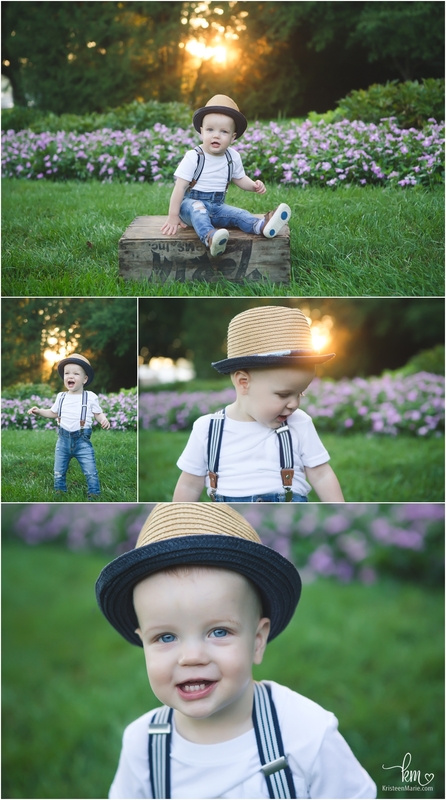 HIs expressions are just the greatest- so full of vibrancy and sweetness! It has been wonderful watching you grow, Arlen! Yay! Happy First Birthday little man! 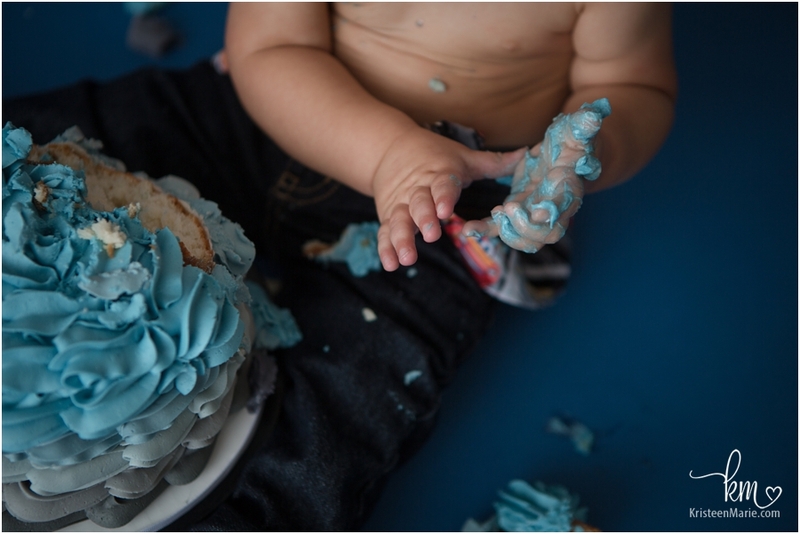 I love working with children for their cake smash first birthday photos. 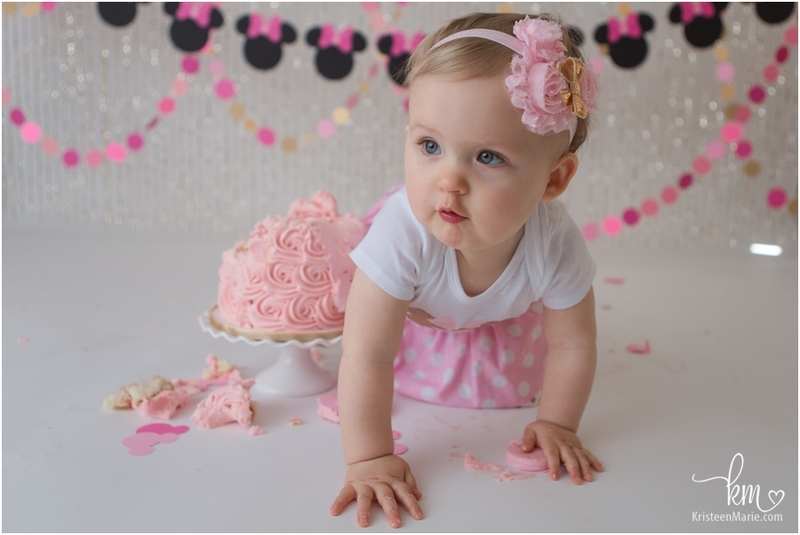 If you are interested in celebrating your child’s first birthday with a cake smash session, feel free to reach out! 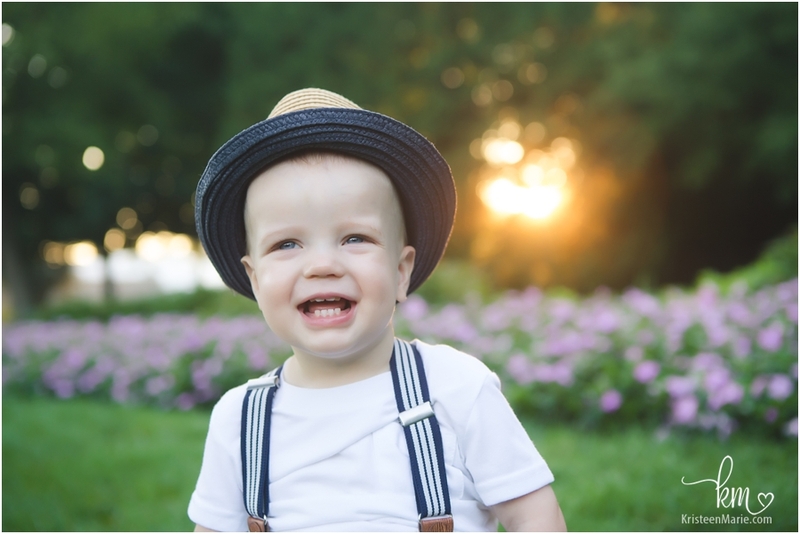 I’m an Indianapolis photographer and I would love to work with you and your family! Getting up at sunrise for a session is always a win and this session was no exception! At sunrise you almost always have the park to yourself which is super nice. Also, you get this very golden light and sometimes, like for this session, you even get that foggy morning dew – talk about dreamy!! Mr. Asher, the birthday boy, was pretty dreamy too! He had a smile for every shot and was full of personality! You can’t help but laugh when you are interacting with him. 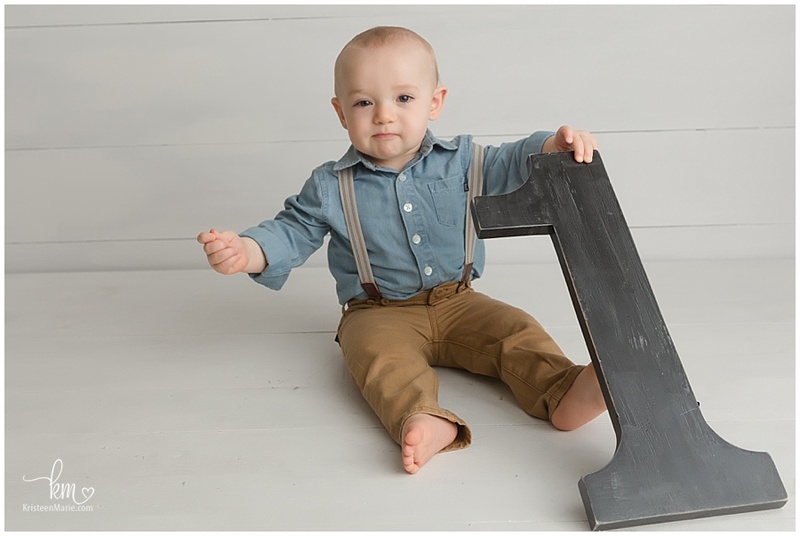 It seems like just yesterday I was taking his newborn pictures. I can’t believe he is already a one-year-old. 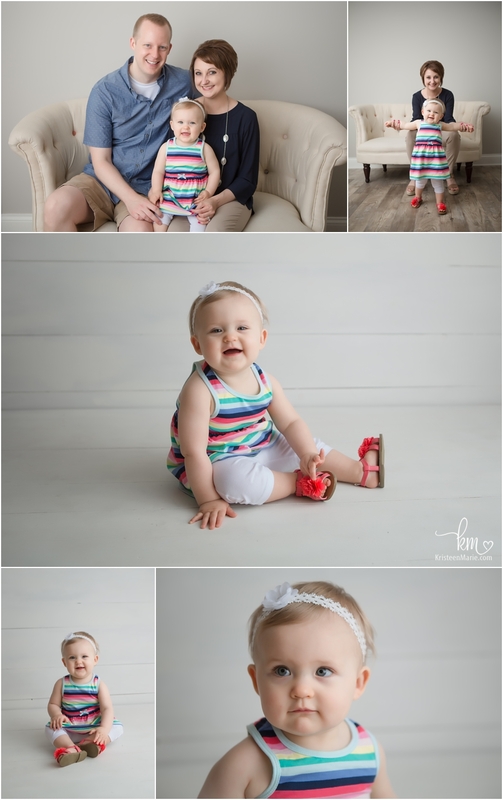 We were able to get some pretty great family photos with Asher as well. 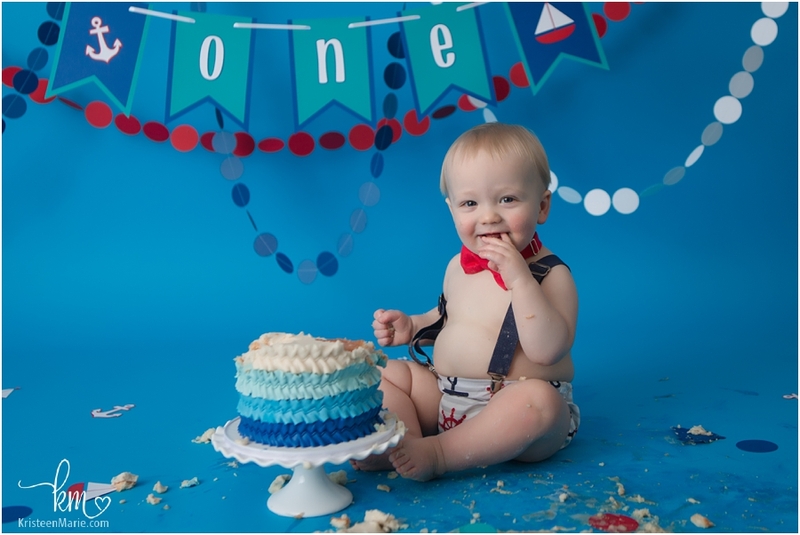 Be sure to check out his cake smash towards the end- it is super adorable! 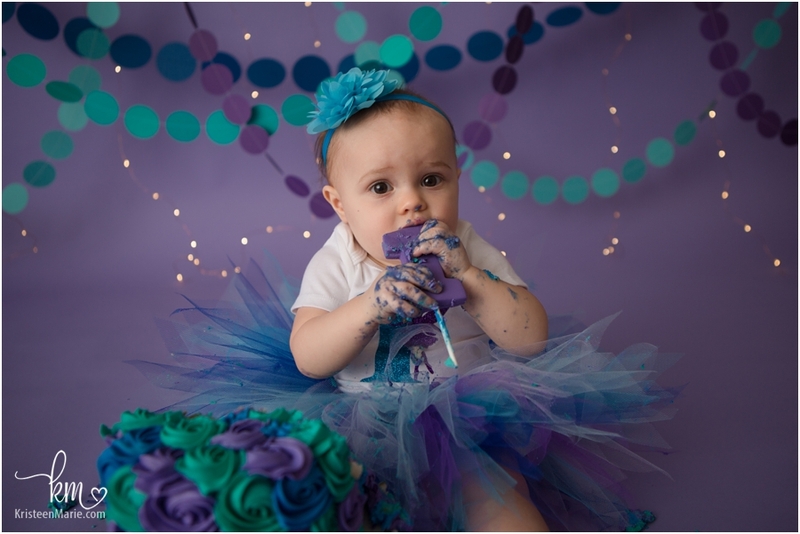 What a fun first birthday cake smash session! I can’t wait to continue to watch this little guy grow. 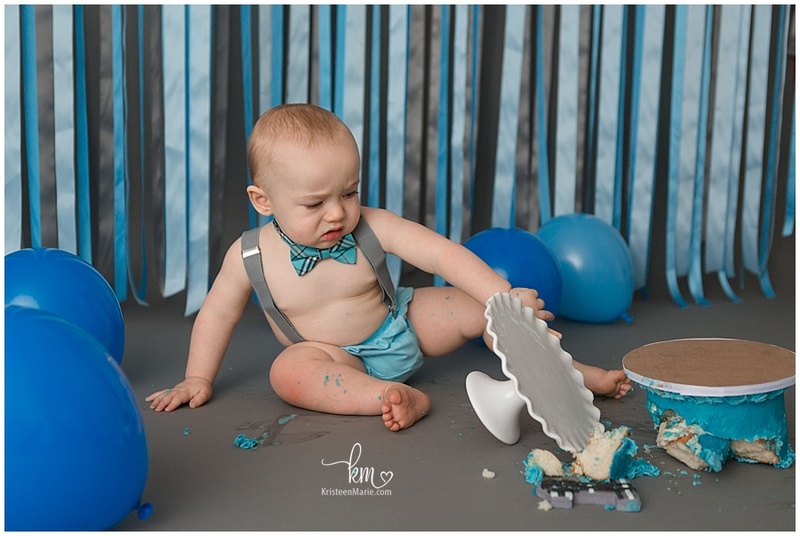 I hope you enjoyed this 1st birthday cake smash session! If you are looking for an Indianapolis photographer please let me know. I would love to photograph your family sometime soon. 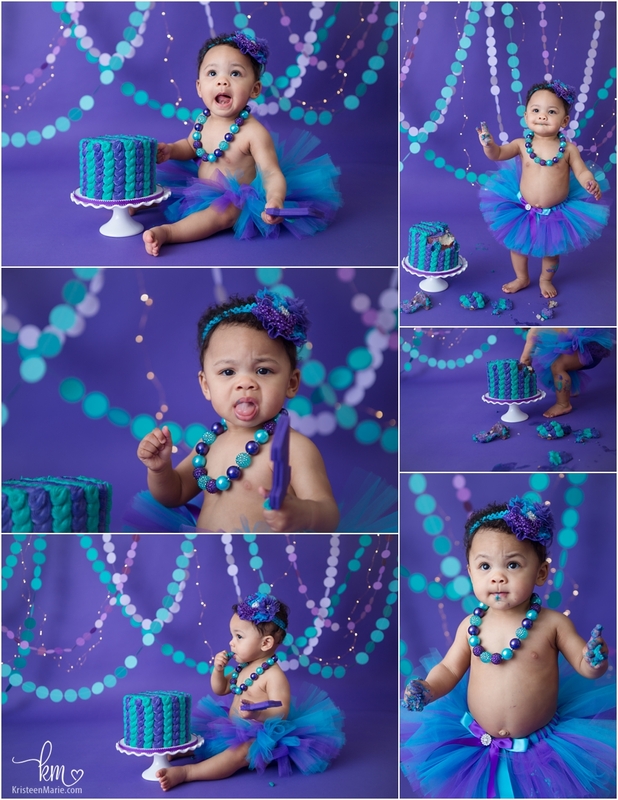 Over the last year I’ve had the joy of photographing this beautiful girl and all her milestones! 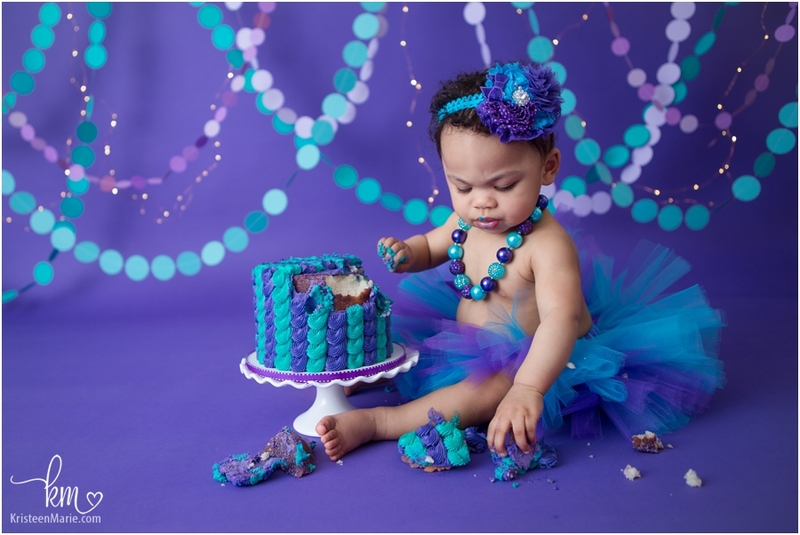 She happened to pick my two favorite colors for her cake smash session – purple and teal. And we added in twinkle lights for good measure. She couldn’t have looked any more adorable if she tried! 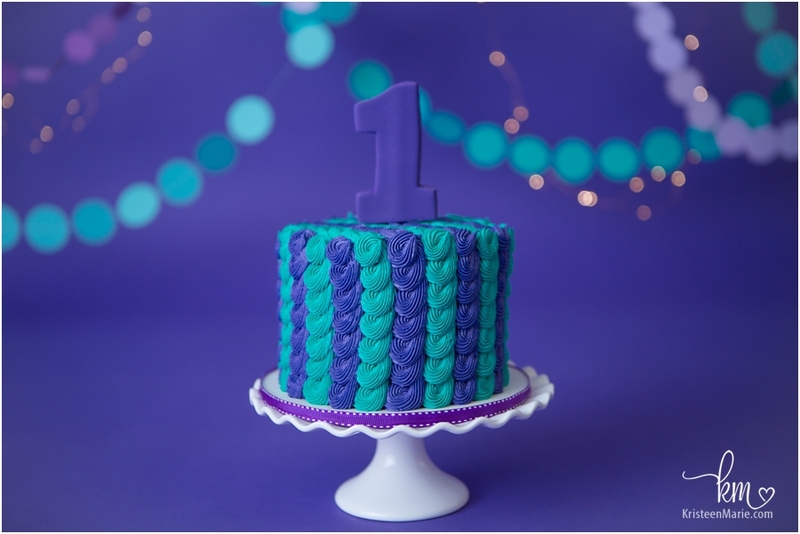 Even though these colors are my most favorite colors- I really do love how they look together and especially how the cake and the teal pop with the purple backdrop! 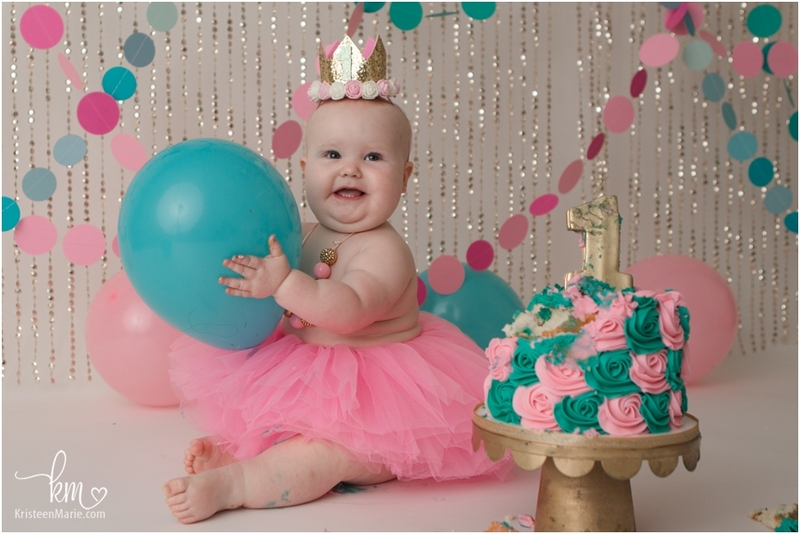 Her little tutu and adorable necklace matched perfectly! 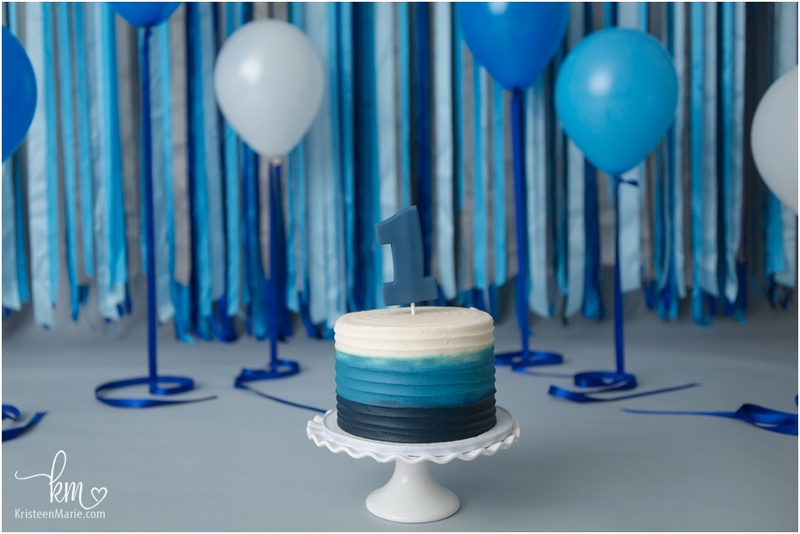 What a great way to celebrate this sweet little star turning ONE! 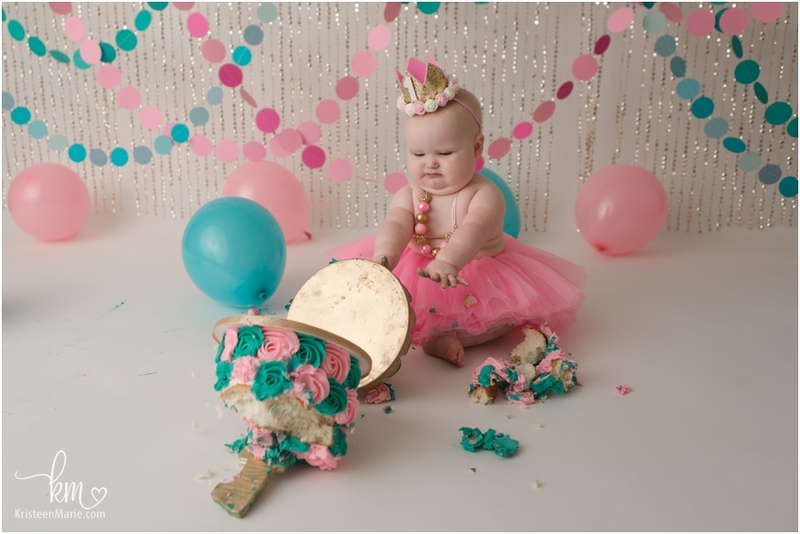 I hope she enjoyed this cake smash as much as I’ve enjoyed watching her grow over the last year. Happy 1st birthday, little lady! Are you looking for an Indianapolis photographer? If so, let me know! 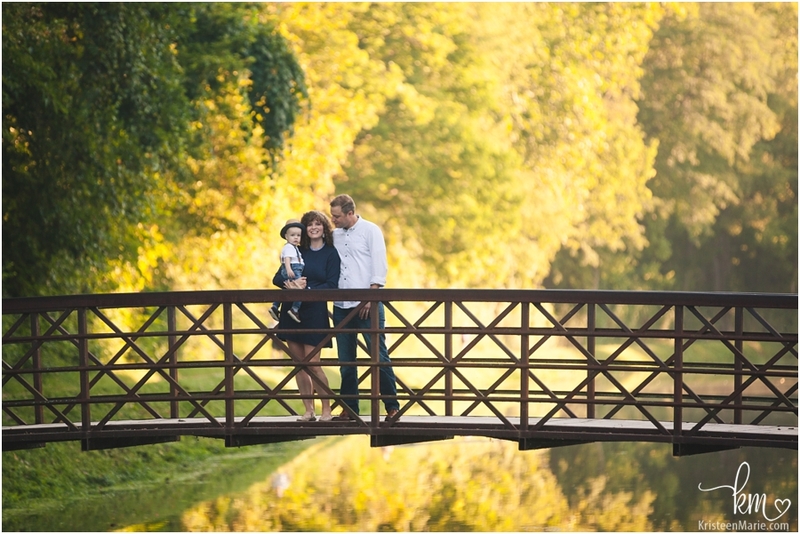 I would love to photograph the next milestone in your family’s life. 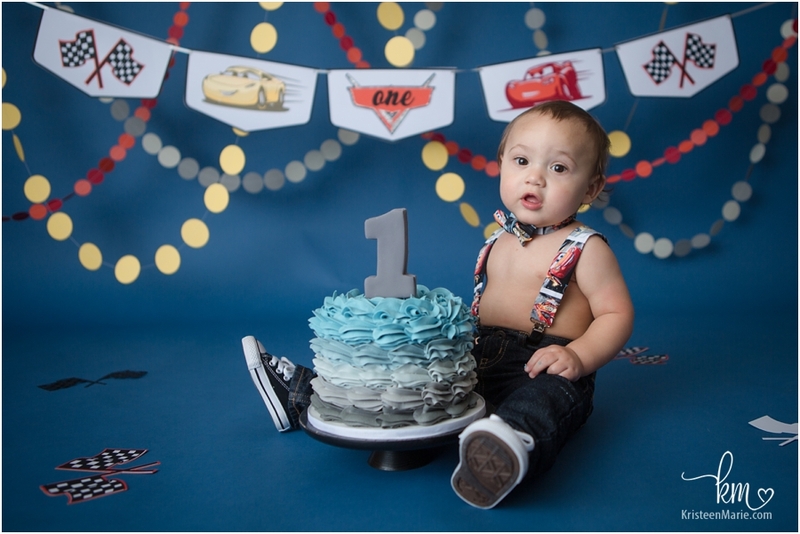 Vroom- Vroom this little man is ONE! He came to the studio to celebrate his First Birthday with a Disney Pixar Cars set-up which he loved- almost as much as he loved his cake! He is such a handsome little one year old and he was oh so happy too! 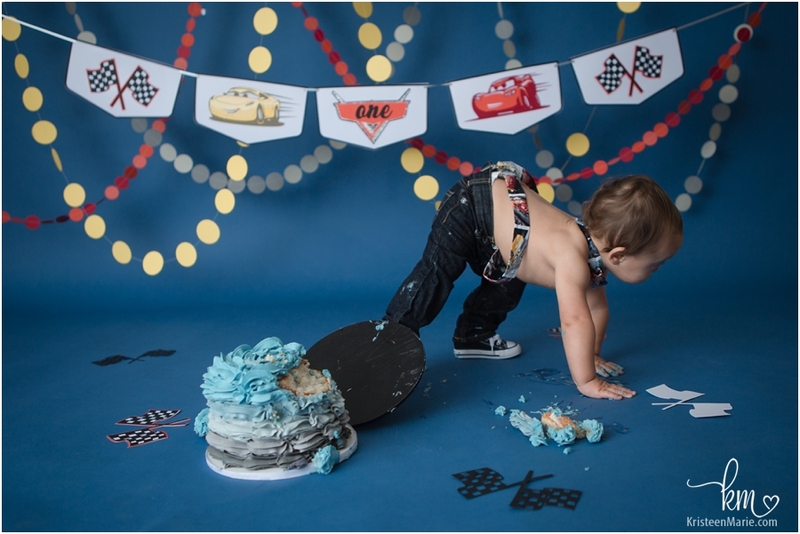 Even though having the Cars theme around may have made him eat a little faster, he definitely took his time enjoying every bite of his cake. 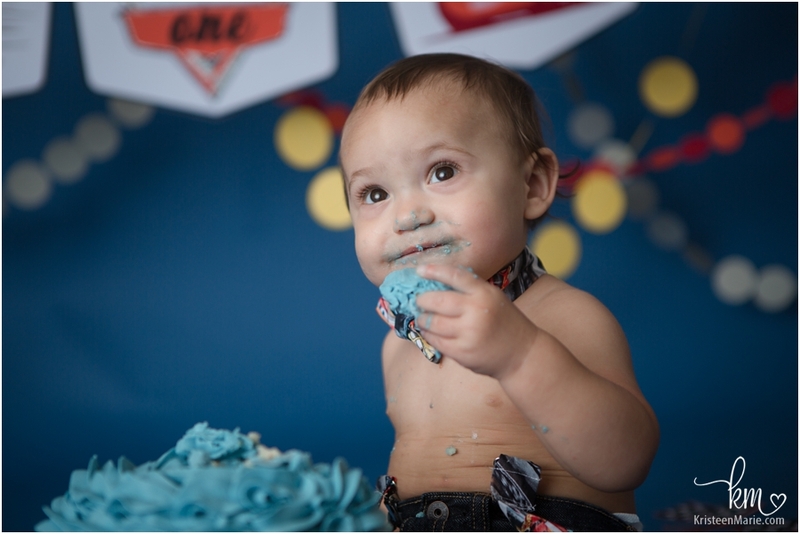 He was really curious about the frosting and I am sure that he enjoyed the sugary sweetness! Don’t his big, brown eyes just melt your heart? 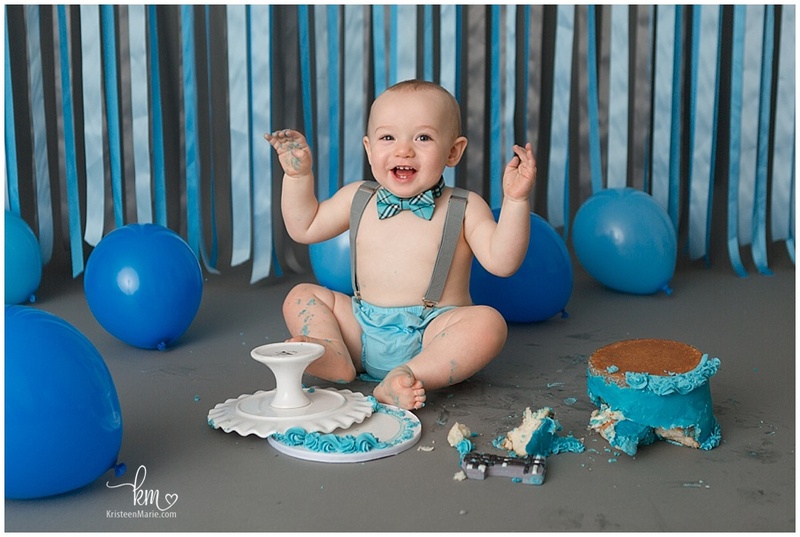 I hope you enjoyed this adorable cake smash session! Are you looking for an Indianapolis photographer? If so, please reach out! I would love to photograph your family or your little one. This smiling one year old has been pure joy to watch grow over the last year. She has been a grow-with-me client since she was a newborn! 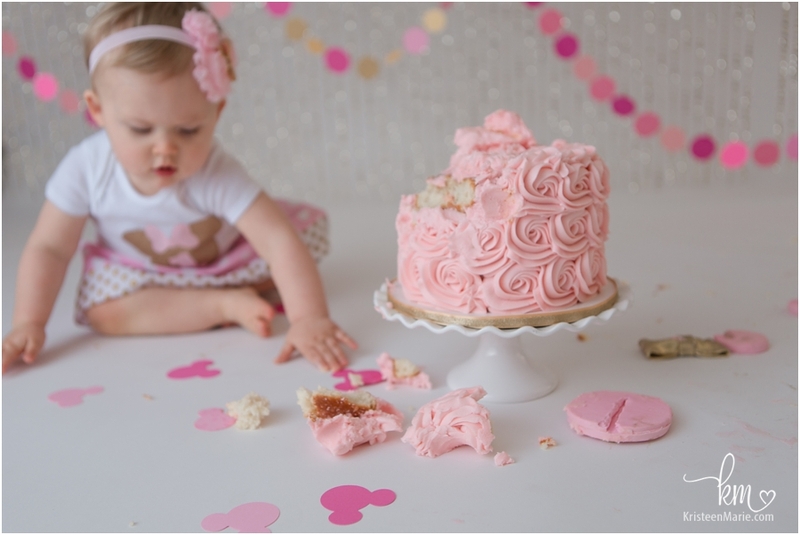 She ended up having a pink and gold Minnie Mouse Cake Smash Session to celebrate her first birthday! Pink and gold is a super popular color combination and Minnie Mouse is a popular theme, but I think that this is my first time combining the two together and it was super cute! 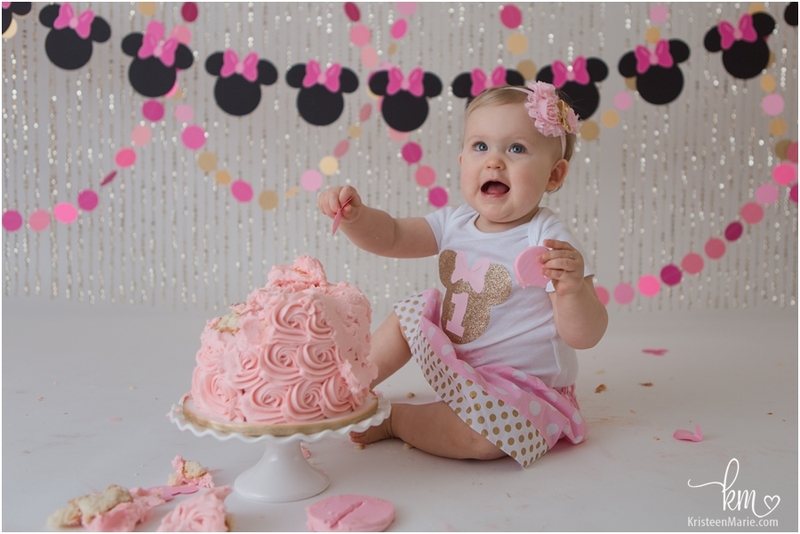 This little sweetie did not make a huge mess with her cake, but she definitely had a great deal of fun and lots of smiles! 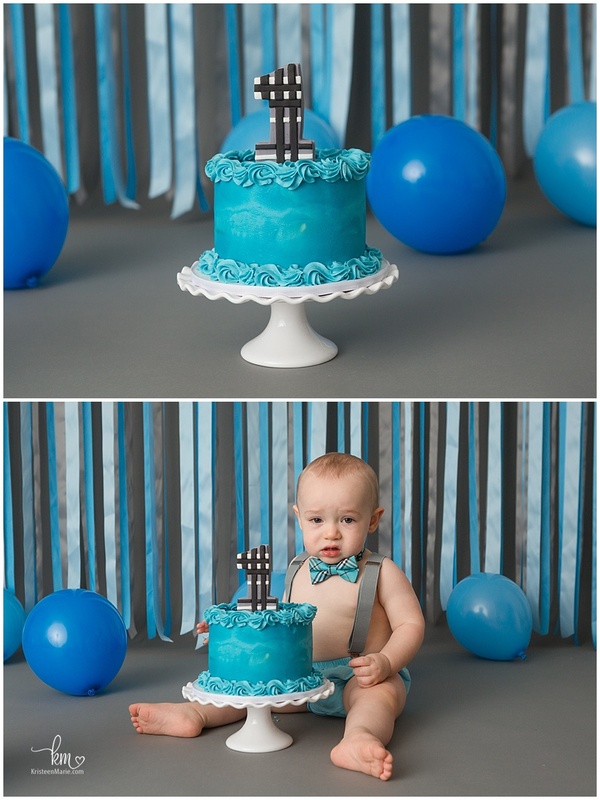 Thanks for letting me capture your first birthday celebration! 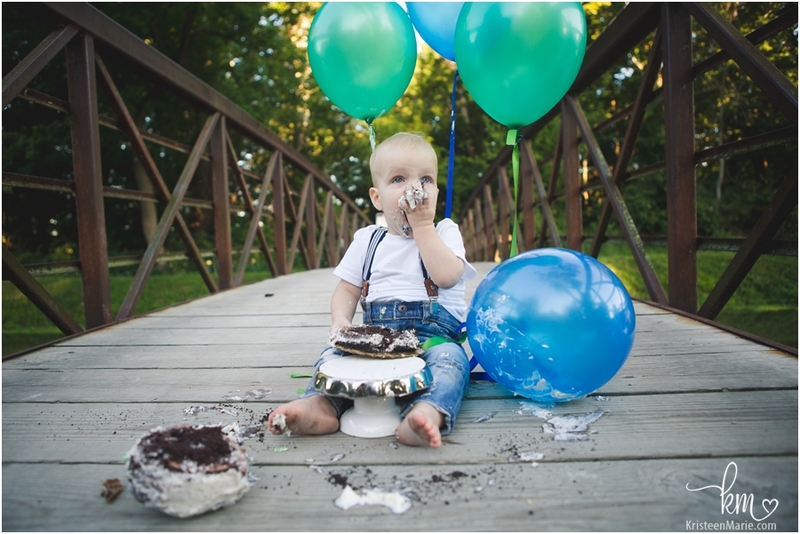 If your child is going to be celebrating their first birthday, I would love to have them in the studio for a specially designed cake smash session! Be sure to reach out and let’s start working together to capture this important milestone for your child!